Snow | Connect. Evolve. Thrive. I live in the Northeast and it will come as no surprise to anyone who has heard about our record breaking winter that I am pretty tired of the snow. It feels unbelievable now that I actually welcomed the first blizzard of our season. Now as I look out on the towering snow banks and the menacing icicles hanging from my neighbors’ roofs, it easy to forget that a month ago I thought snow was beautiful. These days I dream of spring and wonder if I will ever see my lawn again. Given the sheer quantity of snow, it appears I am going to have to wait. And waiting is hard. In our fast paced society we almost never have to wait and when we do, we measure the time in seconds or minutes. An hour wait is unacceptable to most of us. We have places to go and things to do. We have no time for waiting. We certainly have no time for winter. We are uncomfortable with the rhythms of our ancestors who had to submit to the cycle of seasons. Indeed, merely several hundred years ago, people had to submit to the will of dark nights whose completeness was only punctured by the light of moon and stars and the flickering glow of candles and lanterns. We are now masters of the clock even as we become servants to our technology. What we have lost is the value of rest and even hibernation. Perhaps you have experienced periods in your life where you have “gone underground” for a bit- when the demands of life seemed a little too much and too overwhelming and you responded by doing and communicating less. We are often made to feel bad about those times- as if our dropping out was cowardice or perhaps a sign of depression (and for some it may be). But for many it is actually a sign of self-care. Sometimes what is happening is that our bodies and our psyches are telling us that it is time to slow down. It may even be time for a nap…or two. Quiet “unproductive” time is actually really important. 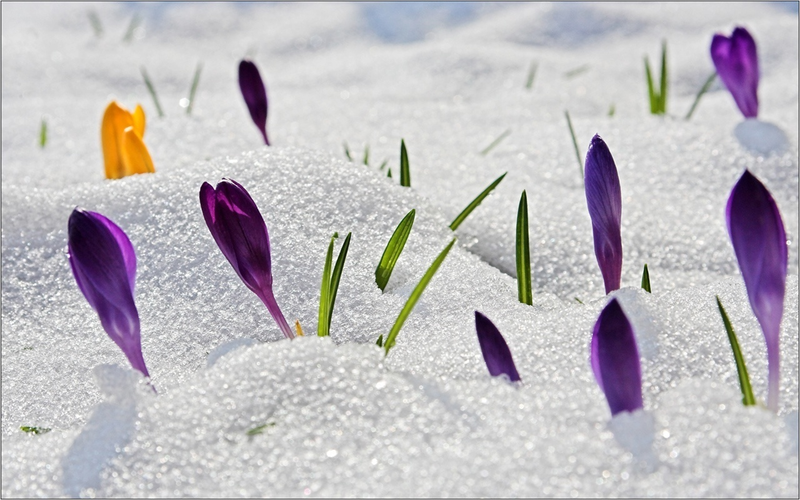 Underneath the snow, plants and seeds are getting ready. They are gearing up for an explosion of color and life. They are gaining energy to grow and blossom. They are not dead (although perhaps just a little buried). The rest that nature takes culminates in growth and life. Similarly, the rest we take facilitates creativity and health. Sometimes we need to hibernate. We need to shut ourselves off from the rest of the world and quietly grow things within ourselves. When we are ready to shovel out and step into the sun, we will be capable of more than we knew was possible. So as I look out the window and see the sun gently warming the snow, I must content myself with waiting and the knowledge that beautiful things are happening beneath the surface.